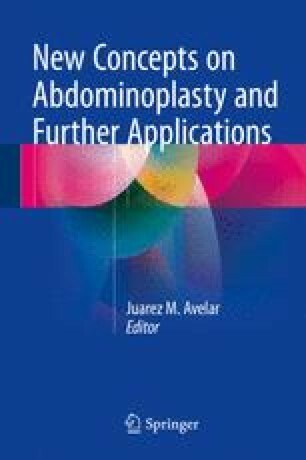 Surgery for abdominal wall has showed significant progress in recent decades, related to reduce the area for undermining, as well as on the size of the final scars. We have observed cases of minor localized adiposities with reduced muscular diastases but with significant changes of the umbilicus which there is no indication for liposuction, traditional abdominoplasty, or lipoabdominoplasty. Also there are patients who do not want to undergo operation that results to long final scars with quick return to normal activities. We describe tactics that aim to correct (a) the excess abdominal fat with small diastases medial muscles; (b) navel changes, including the so-called sad navel and the prominent navel; (c) small umbilical hernia, which may be present alone or together; (d) other congenital changes in small proportion; and (e) associations of the latter, with excess skin and fat of the lower abdomen and/or transverse scars of the lower abdomen and upper abdomen excesses and laxity. The elasticity of the skin is a favorable anatomical condition to make possible to perform the operation all around the umbilicus. Through two small curve cutaneous incisions, it is possible to undermine the local panniculus and also to perform plication of the rectus abdominis. Technique: Three areas must be treated: (a) localized adiposities in the abdominal wall, flanks, and other regions of the trunk; (b) acquired and congenital deformities of the umbilicus; and (c) excess skin and transverse scar in the lower abdomen. Surgical demarcation must be well performed before surgery. For patients presenting upper and lower diastases of rectus abdominis without previous scar on navel, two incisions of 1.5 cm long each are drawing on above and below the umbilical region. From these lines two elliptical areas to be undermined are drawing a similar V and inverted V, with the base turned to the umbilicus. Skin incisions are done followed by cutaneous undermining of the demarcated areas on superior and inferior segments of the elliptical-shaped areas, with preservation of umbilical pedicle and two skin islands. When patient presents hernia, its correction is performed. Plication of the aponeurosis of the rectus abdominis above and below of the umbilicus is done with mononylon 0. Next, the umbilical pedicle is sutured to the aponeurosis with three mononylons 3-0 in the upper and lower portion. In case of “sad navel,” usually only one single incision is done on the upper portion of the navel, and plication of the aponeurosis of the rectus abdominis near the umbilical pedicle is performed. When a patient presents scars due to previous operations or navel with exaggerated diameter, circular incision all around the umbilicus is done with resection of the excess skin. The next steps of the operation are done on similar way as previously described above. Postoperatively, after the removal of the stitches, one can use silicone mold inside the umbilicus for a few weeks, in order to preserve the scar and avoid retraction, contraction, even stenosis of the umbilicus.